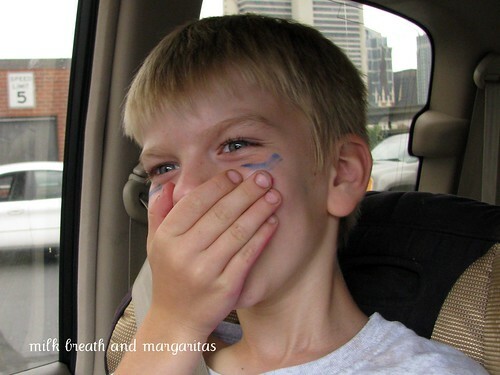 Milk Breath and Margaritas: Are You Ready For Some Football? 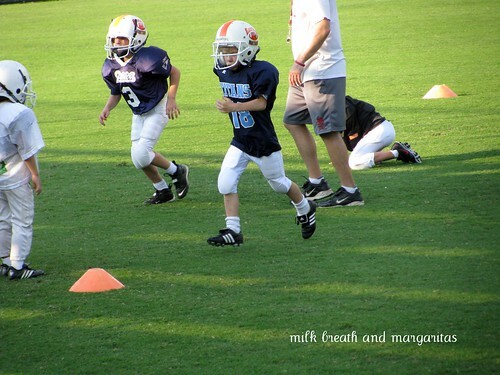 Shark Boy went to football camp for the first time this summer. 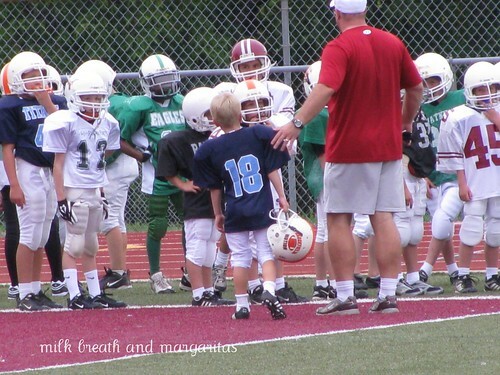 He suited up to meet his teammates. Is it just me or do most of them look at lot bigger than him? He practiced on a professional grade field, astro-turf and all. This facility was so good the Titans would be jealous. 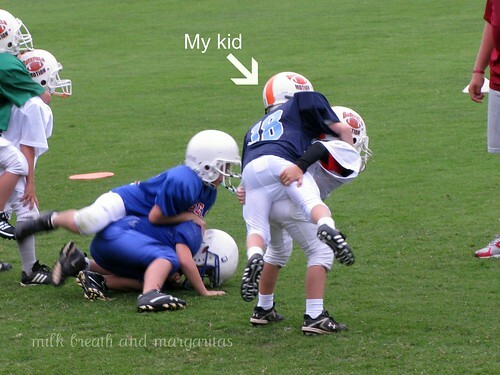 He learned to get tackled. The peanut gallery. 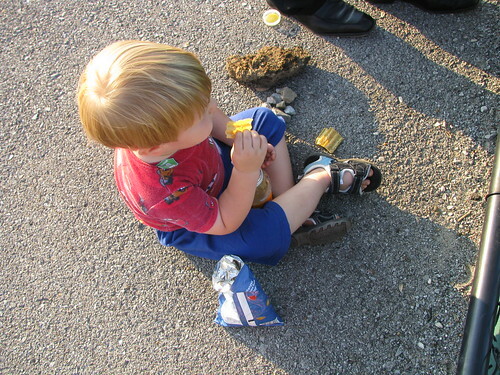 There is nothing like a good snack during the game. It was so much fun to watch him. A classic pose. Or stance. It's probably a stance. Oh look! 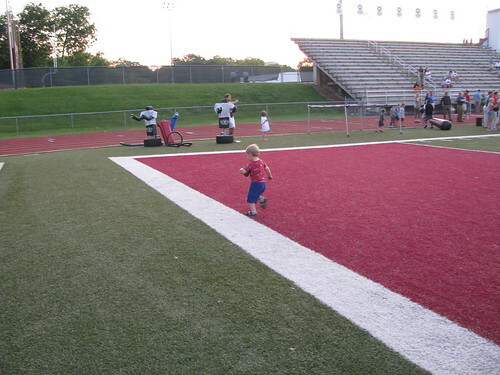 The little guy breaks away unnoticed and TOUCHDOWN! Football camp was a success. Even though he drew eye black under his eyes with blue marker before I caught him and he wouldn't let me scrub it off until the last day of camp. He's my favorite football player of all time. This just isn't right. 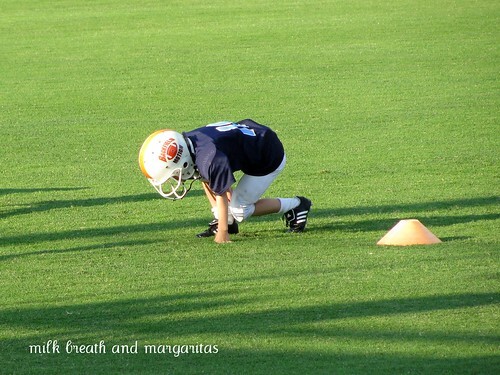 He can not be old enough for football camp. That means mine is old enough and I'm not ready for that. Oh, what great pictures. I love your comment about pose---I mean stance! I guess football can be fun and bittersweet all at the same time, huh? Lori - I know! So hard to believe! Vikki - Football was a blast to watch but you are right - a little bittersweet too. I love the blue "eyeblack." So tough! My little one (age 4) has been on an extended growth spurt. I hardly recognize him. 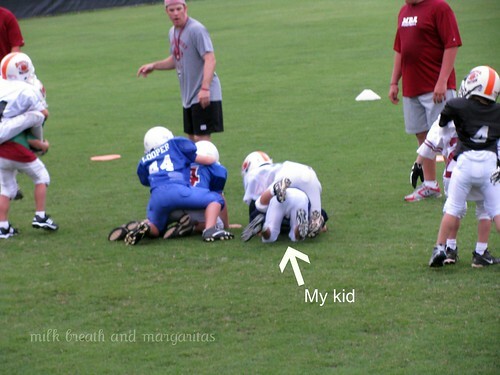 Seeing these pictures makes me think football might be a good idea for him in a few years. Here, and probably all over, it seems like martial arts are the thing. What's your take? He looks like a natural! I think he's my favorite football player, too. They are all giants except him!!?? But absolutely freakin cute. Oh my gosh! I love love LOVE the eye black (or blue?) lol Too cute! de - He did karate for a year. It's good exercise plus it teaches discipline and respect in a way that we really liked. The schedule and the location of the karate place were a challenge for us at the time and that is the reason we didn't continue. I think karate is a great thing for kids to do though. Love, love, love the photos! P must be so proud! That is just too cute! 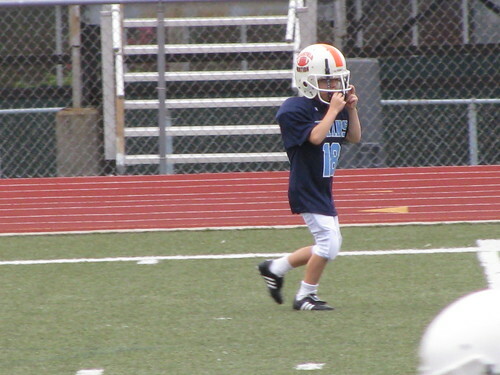 I know football camp isn't supposed to be cute, but they're so little...and it's cute! 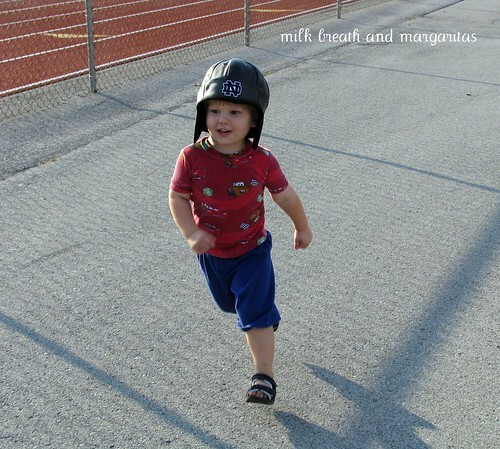 This is the one thing that I will miss about being a mama to girls. No football camp. Who knew football could be so adorable? Football already? It's not even August yet. Adorable pics, especially the one where he's covering his mouth. There's just something about it that makes me smile. Thanks for sharing these, 'cause I really needed to smile today. Fantastic photographs! We usually do soccer camp, but my boys missed out this year on account of our holidays! He's into soccer. I love your shots though and the victory lap is priceless. 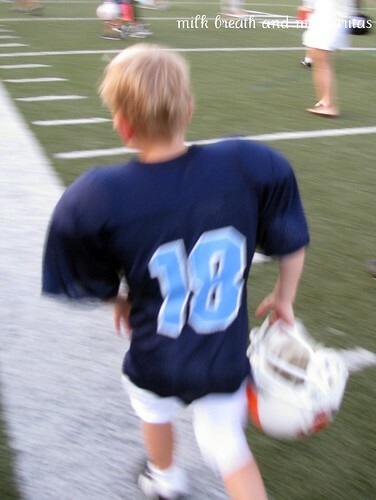 Awww...I'm quite partial to little blonde guys who play football! Your son looks like he's going to give them all a run for their money in football. I am learning more and more with each football practice but I almost passed out when the coach yelled that the object of football is hitting. Are we reversing ten years of my teaching my children not to hit?? Do you think I'll ever get used to this game or am I too much of a sissy? Don't answer.